Ready to begin your project using our products, but certain aspects of WebRTC are still new to you? Looks like everything should work but you want to have a POC just to make sure? Wish you temporarily could have a senior developer on your team who is a true WebRTC expert to get you started quickly? Frozen Mountain’s FastStart does just that. Backed by the rest of our Professional Services and Product Development team, our FastStart developers provide you with expertise that has taken us years to develop – and you get it all for a whole week! 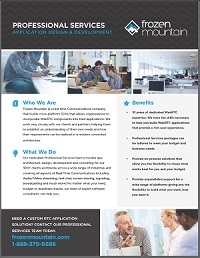 Contact us today to get your WebRTC FastStart underway. Interested in a FastStart or help from our Professional Services team?